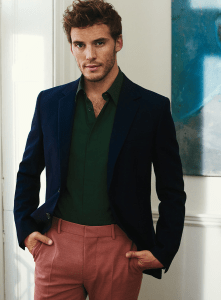 Sam Claflin is featured as the Man of Style in the November issue of InStyle UK. The actors discusses his career, upcoming movies including Me Before You and lots more. He addresses a particular Finnick Odair scene in Mockingjay: Part 2, among other things. Read an excerpt below. So, Sam, let’s cut to the chase. As anyone who has read the trilogy of books knows, in the next instalment of The Hunger Games: Mockingjay Part II [out this month] your character gets “decapitated by a lizard muttation.” How do you even begin to prepare for that? That was the hardest day of work I’ve ever done. I was continually fighting, killing one stunt guy after another, and all for a grizzly end. But that’s why one goes into acting, right? The thrill of victory, the agony of defeat. Weirdly, yes. I was very sporty growing up, and through drama school I focussed more on fight choreography and stage combat and less on Shakespeare. My dad and I enjoyed watching action films: all the Bonds,Braveheart, Gladiator. Lots of epic historical films. But The Goonies was and is my favourite movie. In your next film, the heartstring tugger Me Before You, you play Will Traynor, a paralyzed man. You’re also in talks to play Robin Friday, an English soccer player who died at age 38. Even Finnick, though superheroic, is human in the end. You seem attracted to the mortal in an age when so many actors are donning capes and masks. I’m open-minded. If the right script came along, I would happily jump aboard. But the main thing is, I want to be challenged in new ways & work with interesting people. I’m not in a rush to win an Oscar or even try to go down that route. You’ve got a bit of a tween fan base. Do you feel pressure to act in a certain way? Is it something you discuss with your wife, who is also an actress? Thanks to Sam Claflin Fans for the transcription!